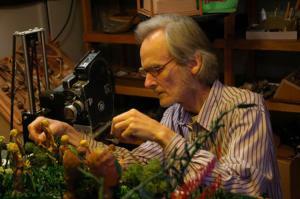 Bruce Bickford is a legend among animation enthusiasts. Born in Seattle in 1947, Bickford has lived his life almost exclusively in SeaTac, Washington. He began his animation career as a teen, animating clay figures driving model cars, before graduating high school and enlisting in the Marines. After serving in the Marines for three years, including eleven months in Vietnam, Bruce returned home and got right back into animation, producing a few short films. In 1973, Bickford was introduced to legendary musician, Frank Zappa. The two would eventually collaborate on multiple musical films, including: Baby Snakes and The Amazing Mister Bickford. Since that time, Bickford has continued to produce striking images in films and shorts, using claymation, stop-motion, and line animation, working mostly out of his garage in SeaTac. For more information on Bruce, please visit brettingram.org.